Vijayawada, Apr 12: Janasena president Pawan Kalyan didn’t follow basic courtesy to stand in line before casting his vote in Vijayawada. All celebrities and leaders get the royal treatment at polling booth. But most sensible leaders try to stand in queue to send right signals to the public. 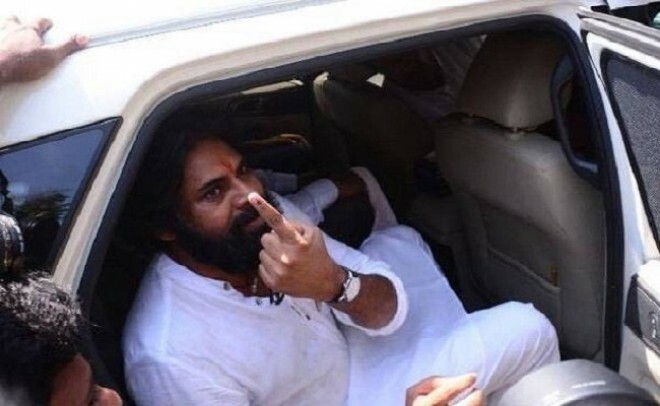 However, Janasena chief Pawan Kalyan cast his vote in Vijayawada without following the line. "We are appalled to know that he is CM candidate but he doesn't even follow the basic queue,” the young voters of Vijayawada who stood in line to cast their vote at the same polling booth lashed out at Pawan Kalyan. Janasena chief exercised his vote in Vijayawada for the first time. He is also contesting from two assembly constituencies – Gajuwaka and Bhimavaram.